We wash the dirt and detritus of our daily lives down the drain, and our showers and sinks are the tools we use to clean ourselves and our stuff. Sink and shower drains are a crucial component of our cleansing routines, and sometimes they balk. Your Atlas service technician has the expertise to pinpoint the location of the blockage and clear your drains with specialized tools, such as a motorized snake and hydro-jetter. If more than one drain is backed up, it may be the result of a blockage further down the line. Your technician will check your sewer lines for debris or tree-root buildup, and clear those pipes. Call Atlas Home Services to Unclog Your Sink or Shower Drain Now! Call us at 703-789-9070 to schedule an appointment, or complete our online inquiry form and we will promptly contact you to discuss your clogged sink & shower drain issue. Chemical drain cleaners can damage your pipes. They should not be used on a completely blocked drain because of exposure to harmful vapors. 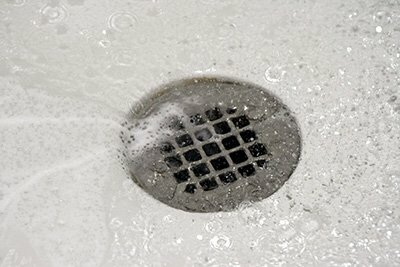 You can help keep your shower drain clog-free with a mesh drain cover that catches hair, soap chunks and foreign objects. Make sure that you clean it frequently.